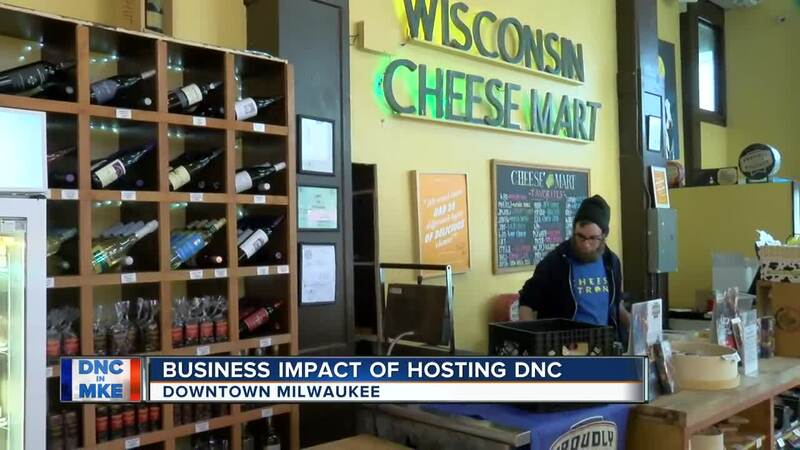 MILWAUKEE — Businesses close to Fiserv Forum will cash in on Democratic National Convention crowd in 2020 . "Restaurants have limited capacity so if 10-20,000 come to town every restaurant is going to busy," said Omar Amin, owner of Build a Breakfast Build a Burger. Downtown businesses like Build a Breakfast Build a Burger believe the DNC translates to more exposure and more money. Amin said being a short walk from Fiserv Forum does not hurt either. "I think staffing is going to be the most important thing to worry about," said Amin. The Wisconsin Cheese Mart, which stand about a block from Fiserv, said they have been waiting for this news to hit. "I just want these people to know cheese travels well," said Jack Daily, cheesemonger at the shop.